"Janis Joplin, Pearl - OBI Box Set (4 CDs)"
JANIS JOPLIN - PEARL - Japanese OBI MINI REPLICA LP TITLES making a 4 CD Box Set- Japanese OBI MINI REPLICA BOX SET Japanese re-mastered Mini LP replica Limited Edition Collection Recorded from the finest Original Masters available. Each title Comes with anti-static sleeves similar to Vinyl LPs, Cardboard packaging exact to the original LP, Re-sealable plastic wrap cases for protection of each collectible Actual miniaturized version of the 12" LP in 4" CD version Special VERY RARE LIMITED EDITION BOX SET ONLY PRODUCED ON FUTURES FOR THIS ONE TIME PRESSING -- were only available in Japan. 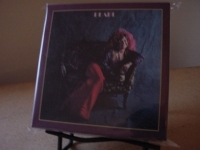 JANIS JOPLIN PEARL OBI CD BOX SET WITH THESE TITLES - PEARL - Fans of Janis Joplin, that very soulful singer who tragically died at the height of her fame but who always gave her all in every performance, are in for a real treat here. This version of her hit album comes in a mini-lp replica sleeve design that has been very well put together with good quality thick cardboard that will hold together very well for a long time and is one of the best mlps designs that I've seen. Also included is an 8-page colour booklet mostly in Japanese and another 22 pager which contain all the lyrics in both English and Japanese. Most importantly, the sound quality is great and also get 4 extra tracks: Tell Mama (live), Little Girl Blue (live), Try (Just a Little Bit Harder) (live) and Cry Baby (live). The live tracks are very good because they show you just how powerful a performer Janis was and her live act must have been some kinda experience judging from the audience reactions on the recordings. Janis was a one-off and no one sounded like her way back then and no one has since. Recommended for fans of great blue-eyed soulful blues performed as if there's no tomorrow. KOSMIC BLUES - BIG BROTHER AND THE HOLDING COMPANY & CHEAP THRILLS . First-pressing-only 4 CD box set containing paper-sleeve editions of albums. - Japanese OBI MINI REPLICA BOX SET. Japanese re-mastered Mini LP replica Limited Edition Collection Recorded from the finest Original Masters available. Each title Comes with anti-static sleeves similar to Vinyl LPs, Cardboard packaging exact to the original LP, plastic wrap cases for protection of each collectible and. Actual miniaturized version of the 12 inch LP in 4 inch CD version Special VERY RARE LIMITED EDITION BOX SET ONLY PRODUCED ON FUTURES FOR THIS ONE TIME PRESSING These are Japanese digitally re-mastered Mini LP replica CDs (the OBI Edition). This Limited Edition Collection has only VERY FEW made world-wide and are immediately Out of Print. Recorded from the finest Original Masters available. Comes with anti-static sleeves similar to Vinyl LPs, Cardboard packaging like an LP. Actual miniaturized version of the 12inch LP in 4inch CD version.